Habit: Annual, hairy, taprooted. Stem: +- erect; branches 0--many. Leaf: basal and cauline, sessile, entire. Inflorescence: raceme-like cymes, +- terminal; bracts leaf-like; pedicels erect in fruit. Flower: calyx +- deep-5-lobed, enlarged in fruit; corolla 5-lobed, funnel-shaped, appendages present; style entire. Fruit: nutlets generally 4, ovate, covered with +- long, barbed prickles, scar lateral. Stem: 0.5--3.5 dm. Leaf: 1--4 cm, linear to lanceolate. Inflorescence: pedicel 1--2 mm. Flower: calyx 3--3.5 mm in fruit, lobes lanceolate, +- erect in fruit; corolla 1.5--2.5 mm diam, white to occasionally blue. Fruit: nutlet 2--3 mm, marginal prickles in 1 row, bases +- or much wider, generally fused. Unabridged Note: Lappula redowskii var. cupulata generally in warmer, drier places than Lappula redowskii var. redowskii. Fruit: nutlet margin prickles much wider at base, fused into swollen crown. Synonyms: Lappula redowskii var. desertorum (Greene) I.M. Johnst. Citation for this treatment: Ronald B. Kelley 2012, Lappula redowskii var. 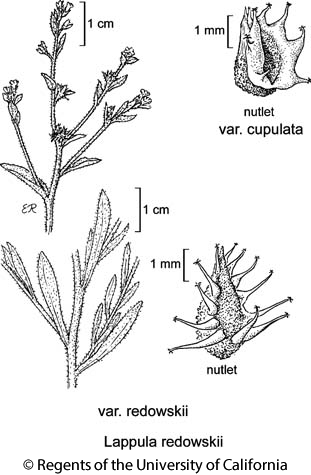 cupulata, in Jepson Flora Project (eds.) Jepson eFlora, http://ucjeps.berkeley.edu/eflora/eflora_display.php?tid=77288, accessed on April 19, 2019. GB, DMoj; Markers link to CCH specimen records. Yellow markers indicate records that may provide evidence for eFlora range revision or may have georeferencing or identification issues. Purple markers indicate specimens collected from a garden, greenhouse, or other non-wild location.